This has been a good time for sports fans, with the World Cup and Wimbledon keeping people glued to their screens indoors rather than enjoying the beautiful weather outside. While I’m well known for my love of tennis (why else would have needed a TV in the office, if not to cheer on Tim, Andy and co at SW19? ), I’m rather less enthusiastic about football. Although, thanks to my sons’ patient explanations, I understand the offside rule and even recognise a few footballers, I would not normally choose to spend my weekends watching highly paid teams playing the beautiful game. But with West End actors berating theatre audiences for watching penalty shootouts rather than the action taking place on stage, and vicars warning bridal parties not to disrupt wedding ceremonies, it seems as if football mania has taken over. I have heard many pundits marvelling at how the success of the England team has bought the country together – not an easy task, as the Brexit negotiations rumble on and on – but it certainly seems as if everyone is willing the young players to bring football home. The last time I saw sport unite the whole country in this way was in 2012, when London hosted the Olympics. 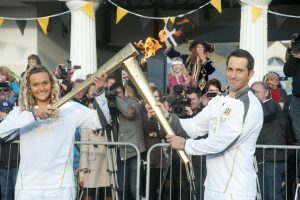 Cornwall had been chosen to host the first day of the Olympic Torch Relay. According to estimates, up to a billion people worldwide were expected to watch the Olympic Flame leaving Land’s End on the morning of May 19. I had been asked to lead a multi-agency communications team, and devise and deliver a communications strategy, using the once-in-a-lifetime event to celebrate (and market) Cornwall to the rest of the world. 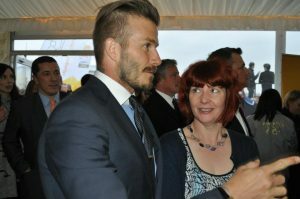 After months of hard work developing activities to provide information about the Torch Relay and promote Cornwall, we were getting close to the big day when we heard that David Beckham would be flying into RNAS Culdrose with the Olympic Flame the evening before the official launch ceremony. Renowned for being a bit of a David Beckham fan, I was thrilled to discover I would be needed at Culdrose to manage the media. With excitement levels at fever pitch among the group, we arrived at Culdrose to wait for the gold-coloured plane, named The Firefly, to touch down on the runway. The world’s media were there, waiting not just for Beckham but also Princes Anne and Lord Coe. As the Cornish contingent had helped to manage the coverage of the moment Beckham lit the cauldron and marked the flame’s arrival on UK soil, we were allowed to go into the VIP tent and get a glimpse of all the famous faces. I would like to say I behaved with great dignity, but sadly I rushed across the room to see my hero and was then photographed looking adoringly up at him – much to the amusement of the rest of the group. The next day, we went to Land’s End to manage an even bigger media scrum, with 240 reporters, photographers and film-crew members waiting to see Ben Ainslie light the first torch. Then it was back to the emergency centre at County Hall, to monitor the torch’s journey through Cornwall. 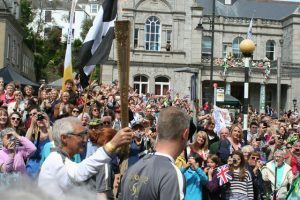 Luckily, all the hard work and planning paid off: there were no crises to deal with and the event was a huge success, with an estimated 189,000 local spectators (35% of Cornwall’s population) watching the first day of the Relay and generating an estimated £3.7 million spend in the local economy. I am very proud of my role in the success of this historic event. My enduring memory, though, is of watching my good friend David arriving with the Olympic flame, and then effortlessly charming the crowds who had gathered to see him.